According to a study by Forrester, companies that allocate resources to UX teams have lower costs of customer acquisition, lower customer support costs, and higher rates of customer retention. Which makes sense! Not everyone is tech savvy, so if your website is cumbersome, customers will likely drift to a competitor whose site is easier to use. Forrester’s Customer Experience Index is an annual benchmark for customer experience quality across large global brands. Criteria include “how effectively respondents felt their needs were met and how they assessed the ease and enjoyability of their experiences.” Forrester’s research demonstrates that the top 10 companies leading in customer experience outperformed their peers on the S&P 500 Index by nearly triple. And on average, every dollar invested in UX results in $100 in return—an ROI of 9,900 percent! As such, it should come as no surprise that companies are investing more and more in the development of UX teams. When Amazon first launched, CEO Jeff Bezos recognized the importance of having an easy-to-use interface. He allocated 100 times more budget for customer experience efforts than advertising, which helped the company grow to where it is today. Gebbia didn’t have any data to back his theory, but wanted to test it out. He and his team got a professional camera, flew to New York, reshot the images, and posted them. Immediately, they doubled their average weekly revenue, resulting in the first financial improvement Airbnb had seen in almost a year. While the job market for UX designers was relatively weak during Donald Norman’s time at Apple, it has skyrocketed in the last decade and, as you can see in the Airbnb example, it can be credited with saving many a failing startup. With the growth of smartphones, apps, wearables, virtual reality, voice technology, and more, the demand for UX designers is at an all-time high and is predicted to continue its upward trend. In the next five years, the design industry as a whole is expected to grow by 10 percent or more. Today, there are over 238,000 UX designers across 129,000 companies in the U.S., and Glassdoor rates UX managers in 19th place on the list of the top 25 highest paying jobs in America. Where Is the Highest Demand for UX Designers? It should come as no surprise that America’s tech capitals–California and New York–lead the charge for UX designers. Other areas with active job markets include Texas, Washington, Georgia, and Illinois, with the metro areas of New York City, Seattle, Atlanta, San Francisco, and Chicago having the highest demand. While these cities represent the companies with the most opportunities for UX designers, it should be noted that many UX designers are freelancers, some of whom work remotely. Thus, if you’re looking to break into the UX design world, you should set your search in these states and cities, but doing so doesn’t mean you’ll necessarily have to move there. Where Will You Make the Most as a UX Designer? 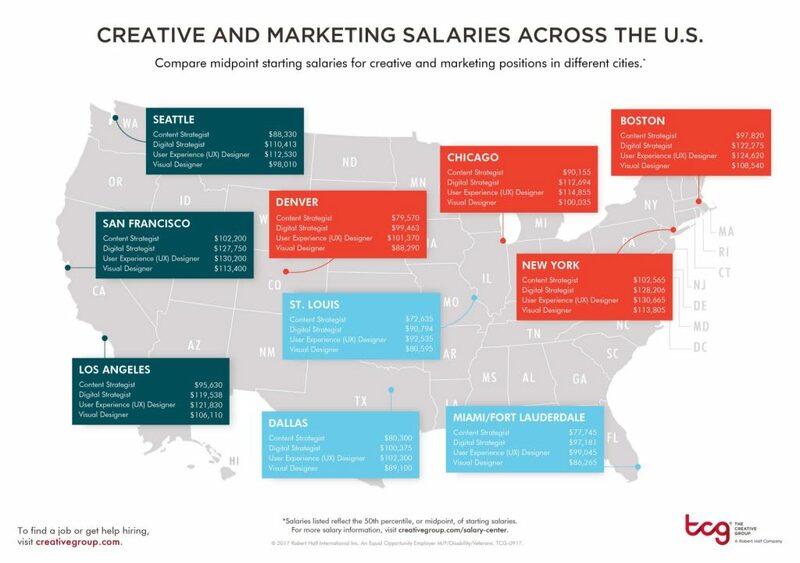 Like any industry, UX design salaries vary wildly based on experience and location, but as you can see in the below snapshot of creative and marketing salaries across the U.S., New York City and Silicon Valley are the highest-paying markets for UX designers. So, they not only have the highest demand, but they pay the most as well. The above represents the 50th percentile of salaries. As of August 2018, Glassdoor reports that the average UX designer salary is $97,460. While that number factors in all design levels, even an entry-level UX designer salary is nothing to sneeze at. A junior UX designer typically has 0-2 years of experience. This can be someone just out of school or someone who has switched careers but is in their first UX design job. A junior UX designer salary ranges broadly, but the average for 2018 is $81,000. The majority of junior-level designer positions require internships and/or a portfolio. Having internship experience can help you get to the higher end of the salary range. Mid-level designers typically have 2-6 years of professional design experience and their starting salaries range by approximately $50,000. On average, a mid-level UX designer can expect to start at around $100,000. Mid-level designers are the most sought-after UX professionals, which may help explain the broad range in starting salaries. Both tech and non-tech companies are currently recruiting heavily for mid-level UX designers, so if you’re a UX designer with a few years of experience, you’re in a great spot. Senior UX designers have 6-10 years of experience and typically have a defined UX specialty—mobile, web, or IoT, among others. Senior UX designers are often brought in when companies are looking to rebrand their site or launch a new platform. They are expected to require little to no training and thus hit the ground running. The average senior UX designer salary is $104,580. In 2018, there has been an increase in demand for senior designers and this trend is expected to continue. The best way to think of a principal UX designer is as the CEO of the design team: it’s the highest level that an individual designer can obtain and requires extensive proven experience. While small and mid-sized companies typically have one principal UX designer, large tech companies have multiple, with each principal focused on a different channel. Intern: If you’re just starting out in UX, make sure you have internship experience. This will not only make you more attractive to potential employers, but it will boost your portfolio with real-life experience. Sharpen Your Skills: While it’s helpful for more senior UX designers to be specialized in one channel or skill set, junior and mid-level designers should get as much experience as possible. John Dennehy, founder and executive chairman of Zartis, an IT recruitment company, recommends getting experience in mobile and Saas. Dara Boland, principal consultant in UX at Morgan McKinley, agrees that it’s imperative for UX designers to have broad skill sets. He says that visual design is the most sought-after skill, as well as interaction design and usability skills. Stay Up to Date With Trends: As the design world is ever-changing to keep up with evolution in technology, it’s imperative for UX designers to stay abreast of trends. Otherwise, people won’t want to use their products. A few popular sites for UX designers include Smashing Magazine, UX Collective, and UX Planet. UX design is one of the most in-demand jobs in the U.S. right now and salaries reflect that. Markets with the most job opportunities include Silicon Valley, New York, and Texas, but many UX designers are freelance, so the opportunity to work remotely or jump from one city to another exists. Young designers are encouraged to get as much experience as possible across a wide variety of channels and programs. Senior designers, however, should focus on one specialty (but still have experience in others). Many UX designers are actually self-taught. If you’re considering a career change, take a look at Springboard’s Guide to UX Design Jobs and learn more about the day-to-day life of a UX designer. If it’s something you want to pursue, consider Springboard’s UX Bootcamp Career Track, a mentor-guided bootcamp with a job guarantee.